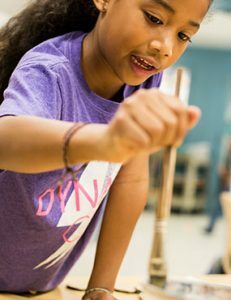 Our After School Program strives to support families and provide a dynamic range of opportunities for students to pursue creative, intellectual, physical, and social interests. We offer diverse activities that encourage self-expression, discovery, and growth. Through hands-on activities and the cultivation of community, children widen their social horizons by working side-by-side with peers from various of age groups. Kids Club and Our Place provide an atmosphere that is both engaging and nurturing. Once children have had a healthy snack and drink, they get down to the serious business of play. Students are free to explore a variety of activities, including arts and crafts, cooking, dramatic play, story times, trips to the Bank Street Library, building, and outdoor play on our deck. Most of our After School teachers work Monday through Friday during the school day as assistant and/or substitute teachers, which allows them to truly get to know the students, develop accurate ideas about what each child is working on, and strategize about how best to support them as they navigate the afternoon. This also sets our After School teachers up to be seen as consistent and trusted adults in each child’s life. Visits to Kids Club and Our Place are $14 per hour if a family registers to join a group for specific days and time periods throughout the entire cycle. These regular visits count toward the three courses required to become eligible to receive Financial Aid. To further support our families, we also offer drop-in service for $16 per hour. If something comes up at the last minute, just email Joanna Sly at jsly@bankstreet.edu and your child’s teachers and we will keep your little ones entertained and safe until it is time to go home. Drop-in services are not eligible for Financial Aid. Kids Club and Our Place are open until 6:00 PM daily unless otherwise noted on our school calendar.